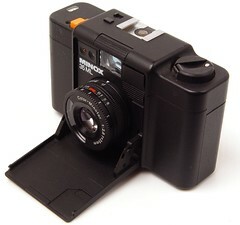 The Minox name carries James Bond cachet and the Minox 35 line has the honor of being the smallest production full-frame 35mm camera made. When sold in the 1980s the ML 35 was a high end and expensive item. These days they still have a enthusiastic band of followers but they also have a reputation for bad electronics. Due to the digital revolution Minox 35's are not fetching high prices any more - if you can find one in working condition they still make great pocket cameras that will give far better results than a LOMO. The 35 ML's lens is a 35mm f2.8 and it is scale focusing. Its exposure system is automatic or aperture priority. The Minox 35 ML bears a very strong resemblance to the Balda CA 35; both cameras, as well as the rest of the Minox 35 and 110 line, were manufactured by Balda Kamera-Werk in Bünde, West Germany. 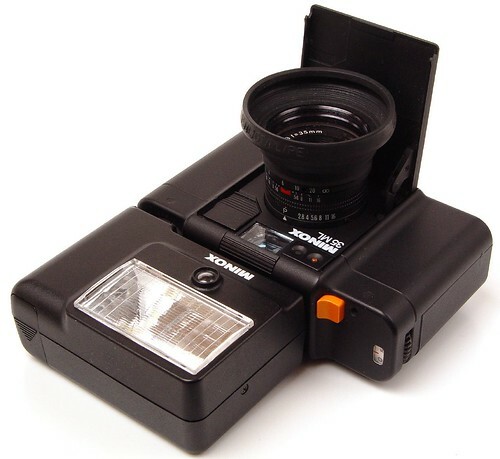 Camera Type: 35mm full frame compact camera.